If you’re looking forward to buying the Galaxy S6 or the S6 Edge here in Bangladesh, be sure to pre-book as Samsung Bangladesh has already established a pre-booking site. What you really need to look at before pre-booking the Galaxy S6 and S6 edge are the terms and conditions. Initially, after filling up the booking form, you would have to deposit BDT 9,900 within 72 hours at any chosen outlet (selected while filling up the form). Once the devices are ready to ship, you will have two options: either pay the rest amount at once or pay in 12 months EMI. EMI is applicable with Standard Chartered Bank, BRAC Bank, Bank Asia, City Bank (American Express), UCBL, DBBL, MTB and EBL credit cards only. Grameenphone was the first mobile network operator to join in providing the devices with their customised plan. Robi and Bangalink will soon follow the bandwagon to provide exclusive offers to the potential consumers. As of now, the price of the Galaxy S6 is BDT 69,900 whereas the Galaxy S6 would carry a price tag of BDT 79.900. BDT 10,000 difference for the curved screens! 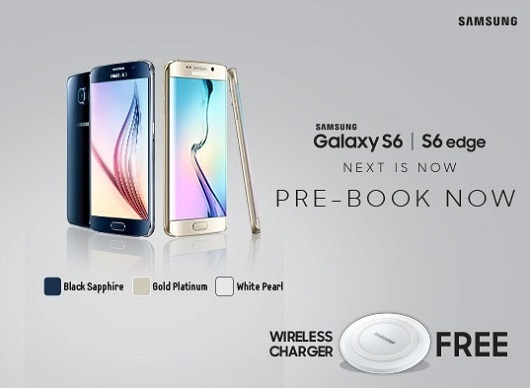 Oh, and you’ll receive a free wireless charger with the S6 or the S6 Edge!